1 Year Warranty on all work: Huyser Asphalt warrants and guarantees the quality of materials and workmanship to be free of any defects for a period of one year from the date of installation. This warranty does not include damage caused by gas or oil spills, sharp turning tires, or normal wear and tear. As a general guideline, driveways and parking area surfaces should have a minimum slope of 2 percent (2%) or 1/4 inch per foot. On occasion, small puddles may occur for a short period of time. If there is any standing water after a 24-hour period this constitutes a drainage issue and will be addressed. Warranties do not include acts of nature: cracks, breakage, settling, heaving due to weather cycles, cracks from driving on the edges of the asphalt. A typical warrantied may be visible and look different than the original asphalt for a period of time until the asphalt is sealcoated. 5 Year Limited (3” min) Asphalt Paving Warranty: After the 1 year warranty has expired we are pleased to offer an additional 5 year extended warranty on our (3” min) asphalt paving. This warranty will cover workmanship and materials automatically for no charge. This warranty will automatically be added to any job if Huyser Asphalt maintains the original asphalt paving. Proper maintenance required for this extension of the original warranty will consist of yearly hot rubber crack filling if needed and sealcoating every 3 years. As a preferred client of Huyser Asphalt, you will receive a 10% discount on this work during the warranty period. 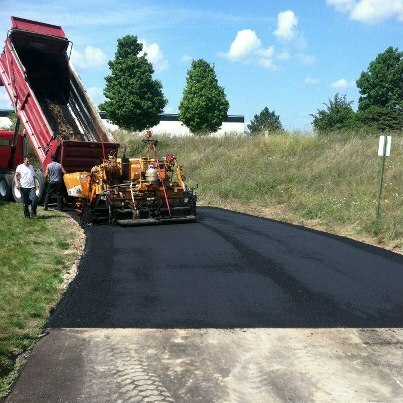 Huyser Asphalt will manage the yearly maintenance program and provide you with any required maintenance for the current year until the warranty period is over. Please call us if you have any questions about our warranty. Huyser Asphalt cannot be responsible for damage of sealer due to lawn chemicals or sprinklers, domestic animals, foot or vehicle traffic for the appropriate sealer cure time. This is usually 24 to 48 hours. Huyser Asphalt will not be responsible for damage due to excessive standing water, standing gravel, snowplows, tire chains, or winter salt applications, also for any gas, oil or anti-freeze on your sealed surface. Huyser Asphalt will not be responsible for sealer peeling and flaking due to oil or gas stains on asphalt. (Sealer does not stick to gas or oil). Although we will not warrant this, we will do our best to prime and clean these areas to ensure the sealer adheres to the asphalt. Huyser Asphalt cannot be responsible for peeling and flaking due to tree sap. The owner of the driveway is responsible for power washing their drive before application to ensure there is no tree sap on the asphalt surface. Almost all trees leave a form of invisible sap on asphalt surfaces and cause the sealer to peel after the first winter. Antifreeze and oil dripping from your car. Playground chalk — will come through the sealer. Chocolate — has oil & paraffin wax in it and will peel sealer. (Believe it or not, this happened to a customer). Pitch from pine trees (and possible other sap dripping trees) — brown ring marks or streaks will come through the sealer. Standing gravel from over the winter — wears the sealer prematurely. Also, tire chains on snowblowers will leave marks on the asphalt. Lawn chemicals that are sprayed on the grass and allowed to overspray on the sealer. Wash and wax products used to wash your car — if you use them, do it on the street or on your lawn; sealer will not stick to these products. It will cause a "milky white film" on the asphalt. Foam tire cleaner for white walls that are silicone based product. Anything that has a paraffin wax base.